The first major decision to be made when building this kit is whether to go and build it prepainted as given, and accept that there may be seams and difficulty matching colors for touch ups, or build it as a conventional model and do a complete repaint job. After thinking it over for a while, I decided I’d be happier with a new paint job. That meant I didn’t have to be cautious as to how I was cutting or scraping during the assembly process, as the paint job on the kit parts would be covered up anyway. The kit is intended to be a snap together model, but I think a tight press fit kit would be more accurate. There wasn’t much snapping involved, at least until later when I was trying to mount the legs! Overall though, the parts pressed together tightly, but I elected to use liquid cement to reinforce the joints. There were a few mold lines and some gaps, but nothing too difficult to take care of with some scraping or filing. Most of the joints were along panel lines as well, meaning they didn’t need much cleanup. Assembly moved along quickly; I did most of it in one evening. Then I had some troubles, in particular with the lower torso and the legs. 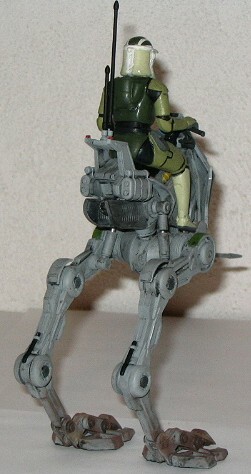 No matter how hard I tried, I simply couldn’t press the legs into position on the lower torso unit. It was so tough, I wondered if maybe I had made a mistake with some of the similar leg parts, and that that was causing the fit trouble. I double checked the instructions against some of the still visible part numbers on the assembled legs, and confirmed that I had assembled the legs correctly. So instead of doing the smart thing, and say gently sanding the round leg holes until they fit on the torso mounts easier, I tried pressing them on again. And snapped the lower torso from the upper torso/seat area! So now I had to sand the break point smooth on both torsos, and then resort to ‘pinning’ the upper and lower torso together. I used wire from a jumbo paper clip and super glue to make my joint; if you wanted to retain the original kits torso swivel ability, you could use some brass tubing instead. After fixing the self inflicted damage and a little sanding to get the legs on, the walker was done and ready for painting. I decided I would try to recreate the movie/box art as closely as I could. I prefer to work with acrylics, so I went hunting through my Tamiya acrylics collection, and decided that XF-19 Sky Grey was a good overall light to medium grey for my basecoat. After using the airbrush, I masked the green areas, and painted them with Vallejo Model Color 833 German Camouflage Bright Green. This color is a close match to the prepainted green that had been on the kit parts. I then went back and painted the small details and wiring with various colors, mostly sticking close to what had been prepainted on the kit. I pretty much left the clone trooper pilot alone paint wise; he was pretty decently painted already, and I’m not a very good figure painter in particular. One of my main reasons for doing a repaint is that it would be a lot easier to do some weathering over that than the slippery, shiny kit plastic; the walkers were pretty battered and dirty in the movie. I gave the kit and pilot a black wash made with artist’s oils, and then followed up with various shades of pastels on the legs and around the engine area beneath the pilot. A few silver paint chips for the walker and pilot, followed by a final clear flat coat finished things up. Overall, this was a pretty easy kit to assemble and paint. As mentioned in the preview, the main stumbling blocks are finding one and the price. I think the level of detail, accuracy, and ease of assembly put it ahead of the releases AMT/Ertl has offered in the past. As an aside, AMT/Ertl has finally announced a couple of Sith kits for the end of the year, a Jedi Starfighter and Droid tank. 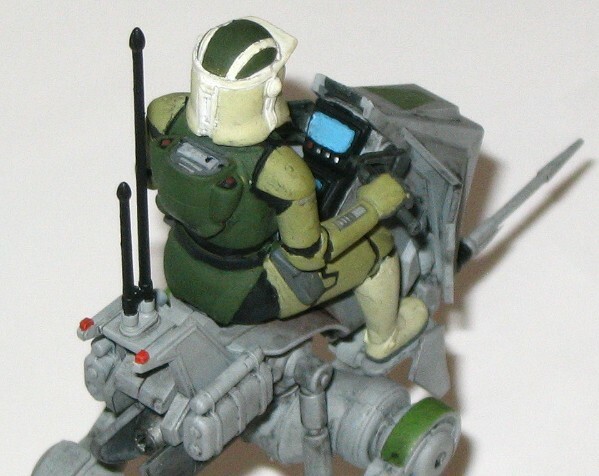 Those will probably be easier to find if you need a Star Wars model fix. 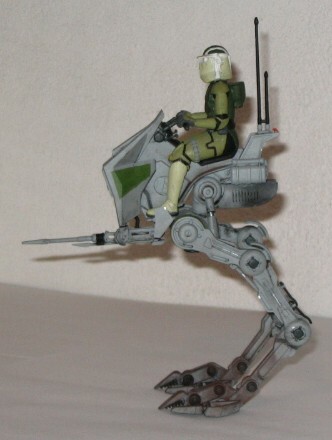 I’m happy with the way my AT-RT came out, and I have a pretty unique piece not too many others will have in their Star Wars kit collections over here. 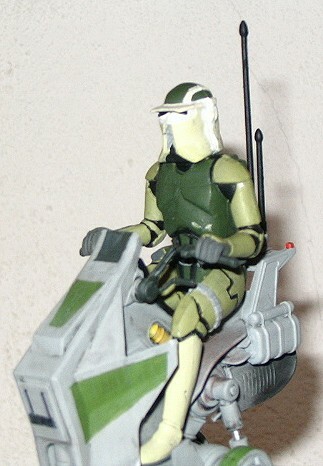 www.starwars.com – the official Star Wars website has a vehicle databank with an entry for the AT-RT. 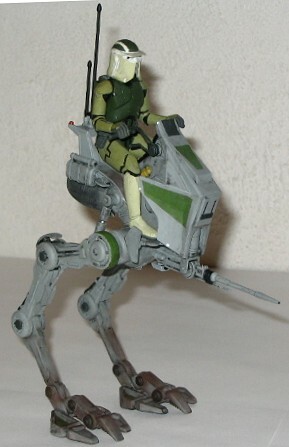 www.revell.de – Revell Germany’s website has many photos of this and their other Star Wars kits.